When I posted the recipe last week for my Healthy Chocolate muffins, I received a far better reception than I’d have dreamed. I mean, post some kind of decadent cookie recipe and you know people will like it, but it’s a surprise- albeit a pleasant one, to discover that people are so fond of delicious yet healthy recipes. At work too, people loved my muffins. And why not? They are delicious, and they don’t make you want to avoid your scale. So I decided to take those muffins and make some other versions. Why should chocolate get all the fun? Let’s invite some other flavors to the party! 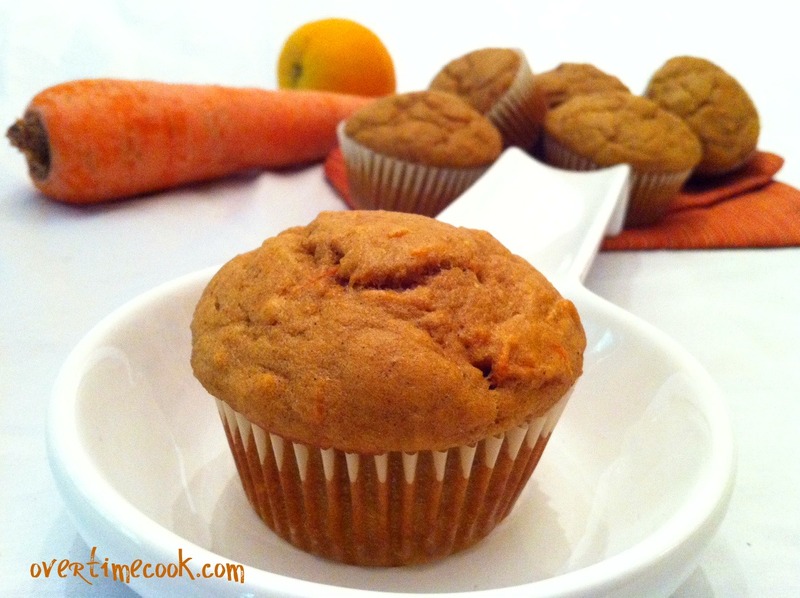 I’m not sure why, but I’ve always been tempted by the non-dietetic carrot muffins I made for my family and friends. And so while I basked in the success of my delicious healthy muffins, I schemed and planned and developed these: Orange Carrot Muffins. Healthy, of course. The texture on these in astonishingly light and airy (they’re whole wheat!) and the taste is phenomenal. But as you bite into a warm muffin, you will notice something else. The aroma of orange that emanates from this muffin is enough to seal the deal; these are just plain delicious. Preheat oven to 350 degrees. Line a muffin pan with paper muffin liners. In an electric mixer, or with a wire whisk, mix together the first 8 ingredients until well blended. In a separate bowl, sift together the flour, baking powder, baking soda, salt, cinnamon and splenda. Gently mix the dry ingredients in to the wet mixture. Stir until just incorporated. Spoon batter into 12 prepared muffin liners, filling all the way to the top. Bake at 350 for 18 minutes. These look just plain delicious. Very good looking recipe you’ve created and a great idea to add the orange zest. A must-have item to add to the breakfast food list and the mid-morning snack list! Actually, these would be great any time of day wouldn’t they! I made orange carrot muffins too! Well actually I didn’t have any muffin liners, so I baked them in a mini bunt pan, so we called them “mini cakes” 🙂 In response to your question about the fruit leather, the baking temperature is 200 degrees. Thanks for stopping by my blog! Looks like you’ve got some great stuff, I’m following you now! Thanks Alyssa! I can’t wait to try your fruit leathers! Can you substitute soy slender with regular milk and agave syrup with real maple syrup? Just want to use what I have in the house. I love making muffins but have never tried orange before – thanks for the inspiration! What is the substitute for 9 packs of splendA? Agave syrup and soy slender,dont have any of those. I only have basic ingredients. Can i sub them with something else? Honey and regular soy milk. Do you happen to know the nutritional values of each muffin? Like calories, fat, protein, fiber?